Hagit Ofran brings you the human stories behind the headlines. In a recent post I wrote about the Jerusalem Municipality’s plan to confiscate land parcels belonging to Palestinian residents of East Jerusalem to construct a parking lot. On one of those lots, the house of the Siam family previously stood, until it was demolished in 2008. So we know that the City of Jerusalem has the manpower and equipment to demolish illegally built structures. Why, then, has it failed to evacuate and seal off an illegal six-story apartment building inhabited by Jewish settlers and provocatively situated in the middle of an Arab neighborhood despite the fact that the Israeli court ordered the destruction of the building three years ago? As I mentioned, it is in the middle of an Arab neighborhood and towers over adjacent homes. Because of the perceived threat to the settler inhabitants of the building, they come and go under private guards, funded by the Israeli Ministry of Housing, raising the first question: is the support of these settlers’ ideologically-motivated home choice an acceptable use of our taxes? Further, this house was built illegally, as no permit was sought or issued for its construction. The court first ordered the municipality to evacuate and seal off the structure in February 2007. The settlers appealed the order and the case has gone all the way up to the Israeli Supreme Court four times. All appeals were exhausted, and on July 2008 the Supreme Court made the order final. But then the saga took an almost unbelievable turn: in a move that shocked many, the municipality declared publicly that it would defy the Supreme Court ruling and refused to demolish Bait Yonatan. The excuse for not executing the order of the court is that there are many other homes built illegally by Palestinians in the area, and dealing with this specific house would discriminate against….the settlers. 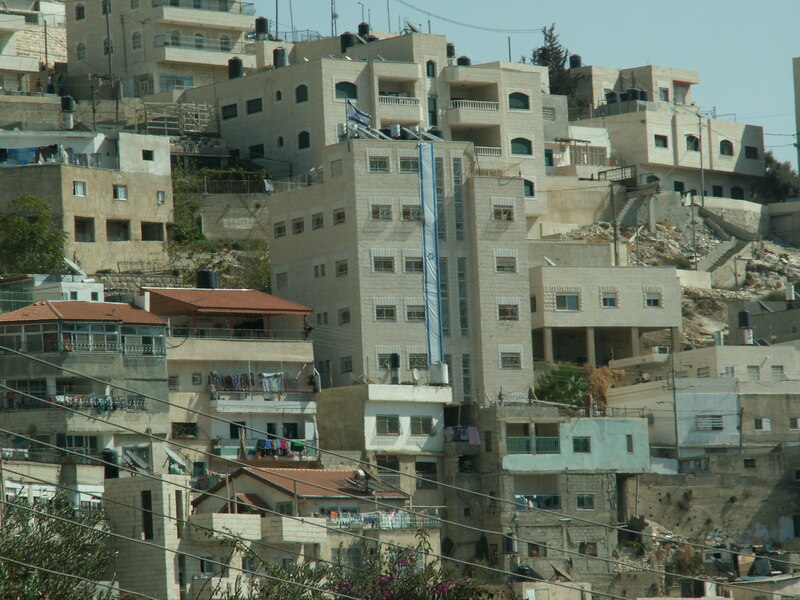 Instead, the mayor has declared that he was working on a comprehensive plan to bring all the illegal construction in the neighborhood into compliance with permitting laws, and to allow the Palestinians some 500 housing units. One of the houses affected by the Mayor’s plan will be the settlers’ house. This might sound like a logical idea at first, but when you dig a little deeper it is apparent that the Mayor’s plan is not only a bluff, which will likely allow no Arab homes to be saved while guaranteeing the continued existence of Bet Yonatan, but also a dangerous intervention by a politician in enforcement of legal court rulings. (Imagine a case in which the Mayor interceded on behalf of a convicted criminal and refused to send him to jail using the excuse that there are many other criminals yet to be convicted and they are now working on a new plan to help all of them…). The bluff is that even if a new plan is ever approved (it will take years if it ever happens), the chances of Palestinians actually getting permits for their homes is virtually zero because the pre-conditions that must be met are almost impossible for Palestinians in East Jerusalem – see a full explanation prepared by Bimkom and Ir-Amim, here. Of course, if the Mayor was really serious about wanting Bet Yonatan to be brought into legal compliance with the Court’s Orders, he could direct that the house be sealed off, as the Court has Ordered, and allow the settlers to return only once it is legal (after his plan is enacted). He would never do this because he knows perhaps better than anyone that the “Plan” is simply a way to buy time and wedge more and more settlers’ homes into the disputed area in East Jerusalem. The more settlers live there, goes the reasoning, the harder it will be for the Israeli government to even consider turning East Jerusalem back over to the Palestinians to be their capital. In fact, the message of the Mayor’s plan to the Palestinians is clear: if you want to get a permit, you must accept the presence of the settlers. Your status as equal residence is not granted, and it will be used as a bargaining chip for us to impose settlers in your neighborhoods. Last week it was reported that the Minister of the Interior ordered the planning committee to discuss a plan for bringing Beit Yonatan into compliance with current permitting laws – again in direct contradiction of the Supreme Court’s order. I would like to remind the government officials who are fighting so hard to save this settler outpost that Israel is a democracy. The Rule of Law must be followed by all government officials regardless of their personal beliefs. I am not the only one who is outraged by the government officials’ efforts to save Bait Yonatan. Israel’s State Attorney recently wrote a very strongly worded letter to Jerusalem’s Mayor and Head of Police directing them to implement the Supreme Court’s Order immediately. You can do something. Write to Mayor Barkat and tell him what you think of his plans. This entry was posted on Sunday, February 21st, 2010 at 10:41 am and is filed under Uncategorized. You can follow any responses to this entry through the RSS 2.0 feed. You can leave a response, or trackback from your own site. I am from vancouver,canada and i wanted to say that East Jerusalem is an occupied city and the illegal jewish settlements there is an obstacle to peace.There should be something done to get rid of the settlements there instead of building new ones.Joseph Biden and George Mitchell are not doing anything progressive to solve this problem.The american gov.knows that the israeli gov. is continuing to build illegal settlements there and something should have been done about this long ago.It will be the Palestinian People who will solve this problem and not the american or israeli govs. Peace Now relies on donations for our work. Visit here now to make a secured donation.